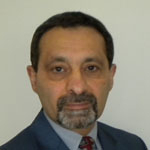 Kourosh Danai joined the faculty of Mechanical Engineering at the University of Massachusetts, Amherst in 1987 as an assistant professor. He was promoted to the rank of associate professor with tenure in September 1993, and to professor in Sept. 1998. Dr. Danai's research is focused on development of robust automation solutions. With his students he has devised the pattern classifying fault diagnostic method Multi-Valued Influence Matrix (MVIM)  and the Structure-Based Connectionist Network (SBCN)  for fault diagnosis of helicopter gearboxes. The MVIM method can assess the diagnosability of the system and use that for sensor selection/optimization. It has been applied to tool breakage detection in turning (in collaboration with GE Corporate Research ) as well as fault diagnosis of helicopter gearboxes (in collaboration with NASA Lewis and Sikorsky Aircraft). The SBCN, on the other hand, does not require prior training, so it is generically applicable to all gearboxes. Dr. Danai and his students have also contributed to manufacturing automation. The important products of his research in manufacturing are the methods of Recursive Constraint Bounding (RCB)  and Virtual Search. The RCB method has been applied to cycle-time reduction in cylindrical plunge grinding, and the Virtual Search has been demonstrated in tuning injection molding processes (in collaboration with the United Technologies Research Center) as well as in helicopter track and balance. The most recent product of his research is the Parameter Signature Isolation Method (PARSIM)  that provides a completely new solution to parameter estimation of nonlinear dynamic systems and has been applied to simulation tuning of jet engines in collaboration with Pratt \& Whitney. Dr. Danai has been the recipient of three innovation awards from NASA. He spent the summer of 1990 at Sikorsky Aircraft Company (working on helicopter track and balance), the fall of 1994 at the United Technologies Research Center (working on sensor location selection in helicopter gearboxes), and the fall of 2001 at the National Research Council of Canada (working on plastic processing control). Dr. Danai has organized two symposia on `control of manufacturing processes' at the 1990 and 1991 ASME WAM, and a symposium on `applied fault diagnosis' at the 1994 ACC. Dr. Danai has been an associate editor of the ASME Journal of Manufacturing Science and Engineering, has chaired the Manufacturing Systems Panel of the ASME Dynamic Systems and Control Division, and was program chair of the ASME Dynamic Systems and Control Division at the 1996 Int'l Mechanical Engineering Congress and Exposition. Dr. Danai was a guest speaker at the 1994 Neural Information Processing Systems Post-Conference Workshop on Novelty Detection and Adpative System Monitoring and at the First Joint Mexico-USA International Workshop on Neural Networks and Neurocontrol. Dr. Danai is a Fellow of ASME.